I have some fun news today! It’s my birthday! Yay! And I made a Kit Kat Cake! Yum! 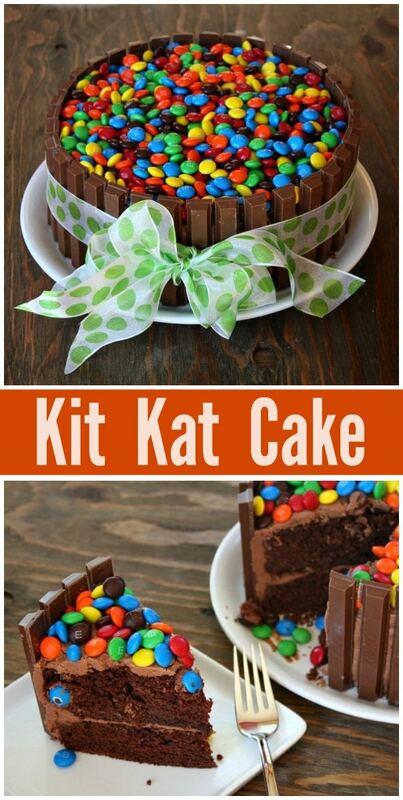 Watch the video showing you how to make this Kit Kat Cake, then scroll to the bottom of this post and print out the recipe so you can bake it at home. I signed a deal with Houghton Mifflin Harcourt to write The Recipe Girl Cookbook when this cake was originally shared in 2013. And I celebrated with this fun cake! 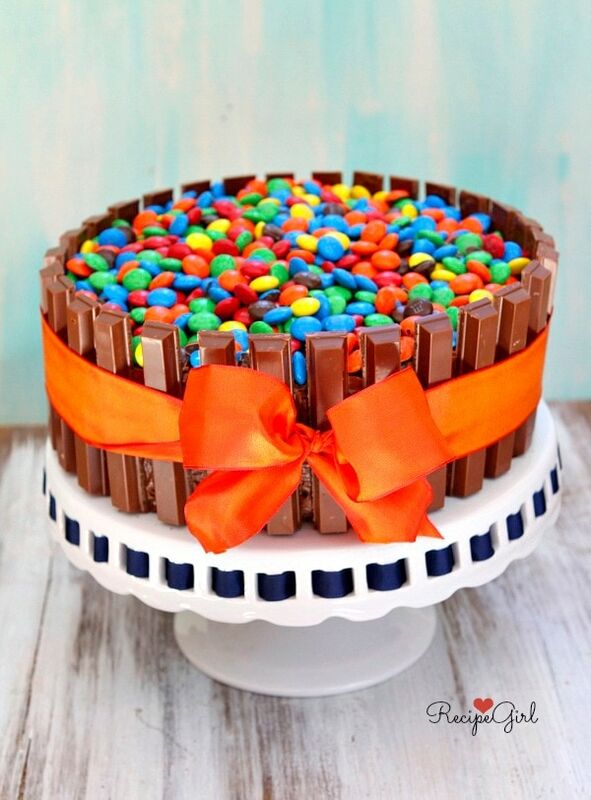 I saw this idea on the internet somewhere… surrounding a cake with Kit Kats, presenting it with a bow and topping it with M&M’s. I couldn’t get it out of my head, so I had to give it a shot myself. It’s really very simple to make. 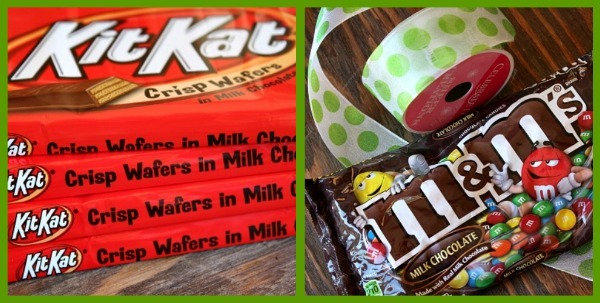 You’ll just need your favorite layer cake recipe (or a boxed mix), frosting, Kit Kat’s, M&M’s and ribbon. I think you’ll be surprised just how incredibly easy it is to pull this off. Frost a layer cake just as you would normally do- first one layer, then add the second and frost all the way around. 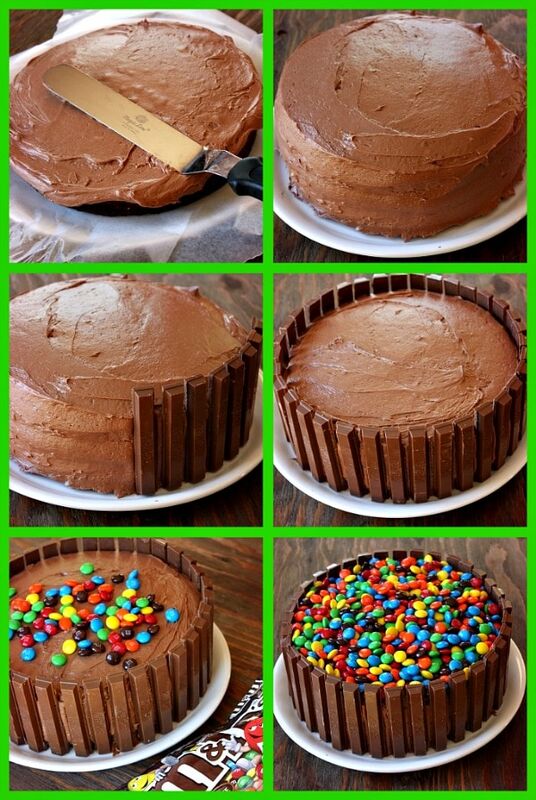 Then stick Kit Kat’s all the way around the cake- they will just stick to the frosting. Then pour M&M’s on top. That’s it! Can you use this method for any kind of layer cake? Yes! 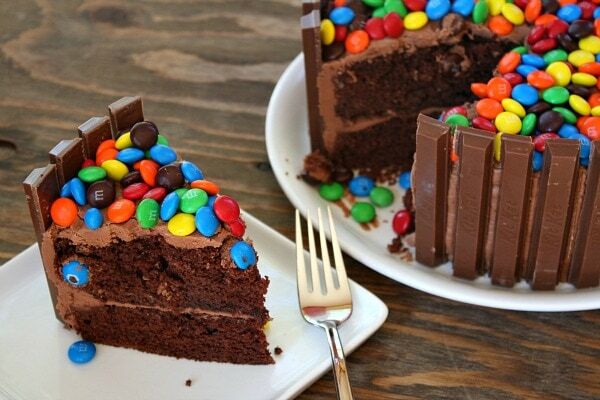 Use your favorite two-layer cake, frost it, attach the Kit Kats, and pour M&M’s on top. 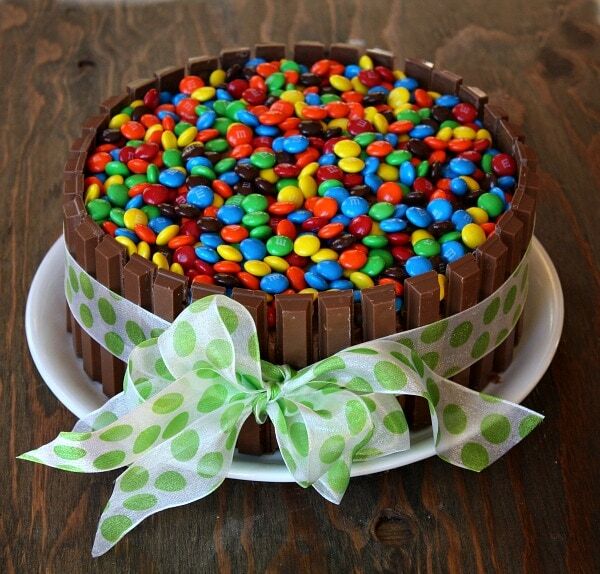 I love how the “sea” of M&M’s makes this cake look so pretty. I can envision making this cake on all of the holidays where special-colored M&M’s are available… red, white & green for a Christmas Kit Kat Cake… pink, white and red for a Valentine’s Kit Kat Cake. The possibilities are endless! Wrap your brightest, cutest bow around the Kit Kat’s. It makes a fun birthday cake. 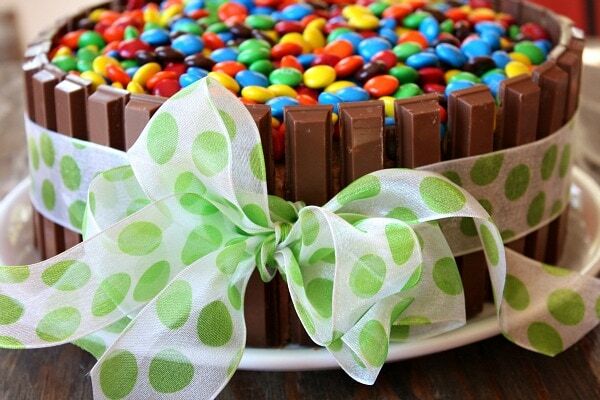 And this Kit Kat Cake is delicious too! Happy birthday to me! 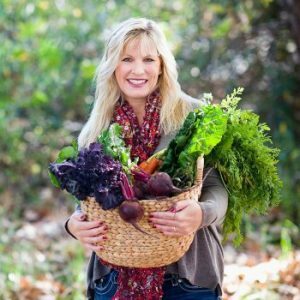 When I quit teaching and debuted my recipe website back in 2006 and then added the blog in 2008, I never imagined that my life would take such a positive turn… that I would end up with a career that I love so much! 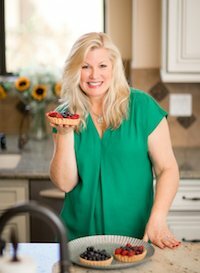 I’m actually excited to wake up everyday and get to work in the kitchen, behind the camera and on the computer. I pinch myself every single day to make sure this is all real, and I’m so grateful to my readers for making all of this cooking and recipe stuff possible. And I’ve written a cookbook! All of it is pretty much a dream come true. I love my job. If you’re looking for more cake recipes that are great for celebrations, you might also enjoy my Red Velvet Cheesecake Cake or this Coconut Cake with Raspberry Buttercream Filling. Chocolate Stout Cake, Yellow Cake and Drumstick Cake are also fun cakes to bake! This is a fun, festive, easy cake to make for celebrations! In a large bowl, whisk together the cake mix, flour, sugar and salt. Add the remaining ingredients and beat with a hand mixer for 2 minutes, or until well blended. Scoop the batter into 6 cupcake liners 3/4-full. 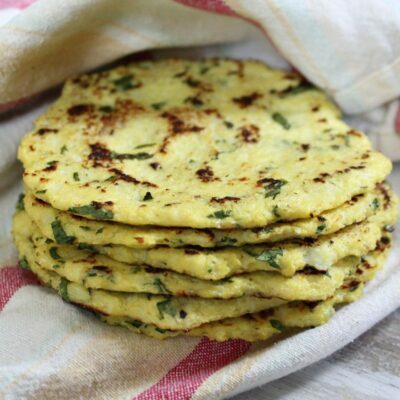 Divide the remaining batter between the two prepared round pans. Bake the cupcakes for about 25 minutes, and bake the cake rounds 35 to 40 minutes, or until a toothpick inserted in the center comes out clean. Let the cake cool in the pans for 20 minutes, then remove the cake layers to a wire rack to cool completely. When the cake is cool, you're ready to assemble. Place one layer on a serving plate, and tuck strips of waxed paper underneath the sides of the cake. In a large bowl, beat butter and cream cheese at medium speed with an electric mixer until creamy. Gradually add powdered sugar, beating at low speed until blended. Increase speed to medium, and slowly add milk and vanilla, beating until smooth. Microwave chocolate chips in a microwave-safe bowl at MEDIUM 1 1/2 to 2 minutes or until melted and smooth, stirring at 30 second intervals. Gradually add melted chocolate to mixture; beat until blended and smooth. Frost the 1st cake layer. Set the 2nd layer on top of the first. Frost the 2nd layer and along the sides of the cake too. Stick Kit Kat's to the sides of the cake, leaving a very small space in between each Kit Kat (1/4-inch). Wrap a bow around the cake, securing the Kit Kat's. 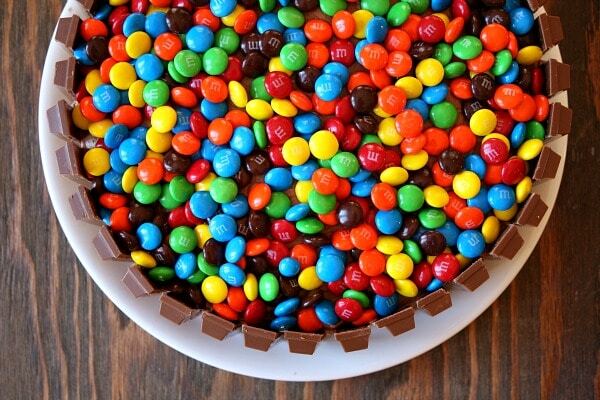 Fill the top of the cake with M&M's. Pull out the strips of waxed paper and discard. 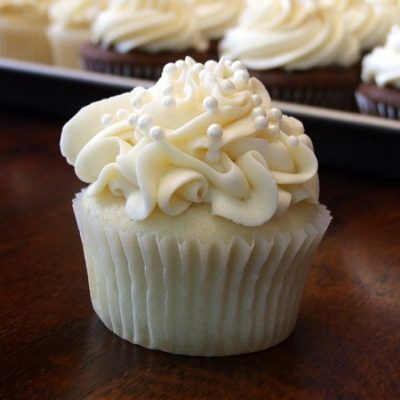 Use any extra frosting to frost your 6 extra cupcakes. 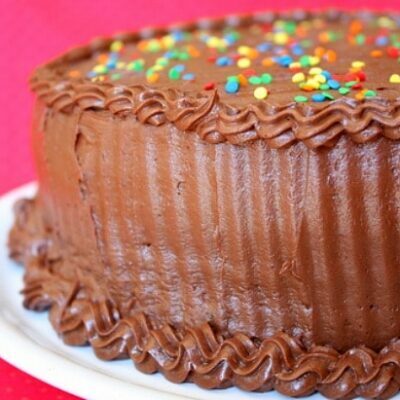 If you refrigerate the cake for a couple of hours or so, it will be much easier to cut and serve. Of course, you'll need to remove the bow just before serving. 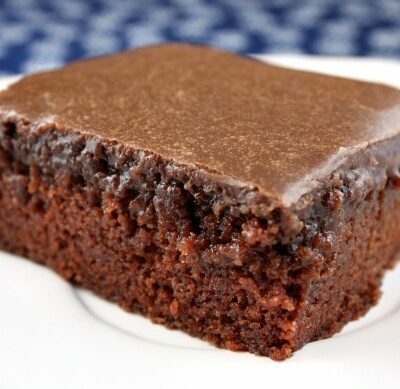 *You can certainly use your favorite layer cake recipe for this cake. 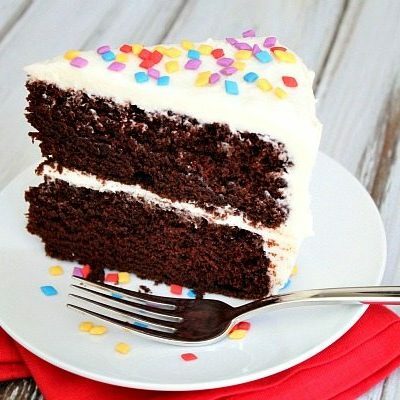 The doctored-up cake mix recipe that is included here is actually quite good! You can also use a yellow cake or your favorite flavor... following the same instructions here for jazzing it up. Technically, you can use all of the batter in two 9-inch round pans, but it might make the cake too high to work for this recipe. You don't want the cake to stand higher than the height of the Kit Kat's- or they will not be able to act as a "fence" to hold in the M&M's. 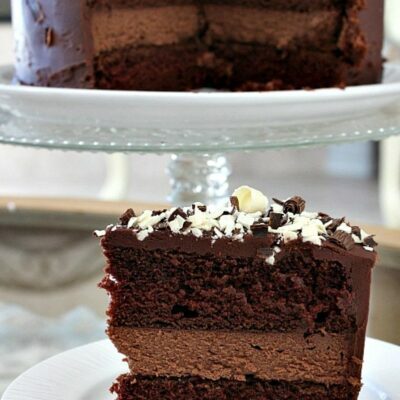 I love this cake. So fun and so delicious!